Four starts, four wins, third overall victory at Schindlhof in a row and thus she took the Manfred & Hilde Swarovski challenge award for good: Isabell Werth also showed at the 24th Manfred & Hilde Swarovski Memorial Dressage Show why she is the #1 in the dressage world. “Many thanks to Klaus and Evelyn, to the Haim-Swarovski family and the entire Schindlhof team. In this dressage show everything is right and nothing is missing,“ the 48-year-old six-time Olympic champion was full of praise for the hosts during the award ceremony, sitting on her Emilio, with whom she had just before easily won the Freestyle with 80.145 percent. More than 2,000 equestrian fans had come to the pretty “Alpen-Stadion“ at the food of the Karwendel mountains for Sunday’s final. 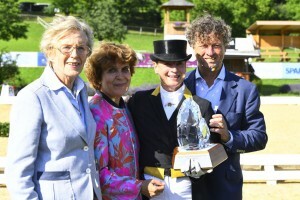 They witnessed a “Werth Festival“ with victories in the Grand Prix Special with her comeback horse Bella Rose (find a report here: www.schindlhof.at/presse) and with Emilio in the Freestyle. “It was a very special show for me, we have seen great sport.“ Isabell Werth was really touched about the comeback of miracle mare Bella Rose after 3.5 years of show absence. “I hope we will all see each other again next year!“, Werth said while waving goodbye to the audience. In addition to the sporting events, there was a lot going on at Schindlhof. Sandro Egger (24) and Benedikt Fischer (18) won the traditional hat competition that was moderated by Mirjam Weichselbraun. During the break, Austria’s world and European champions in vaulting, Jasmin Lindner and Lukas Wacha, impressed with their acrobatic performances. The title in the Austrian State Championship Para-dressage was taken, as expected, by Pepo Puch who surpassed his own world record mark in the Freestyle.